Here in the US, we're starting to get a taste of things to come—and it's bitter. Brutal heat is now roiling the main growing regions for corn, soy, and wheat, the biggest US crops. According to Bloomberg News, 71 percent of the Midwest is experiencing "drier-than-normal conditions," and temperatures are projected to be above 90 degrees in large swaths of key corn/soy-growing states Missouri, Illinois, and Indiana through July 7 if not longer. As a result, Goldman Sachs projects that this year's corn yields will come in 7.5 percent below the USDA's projection of 166 bushels an acre. (Why is a Wall Street behemoth like Goldman Sachs fussing over corn yields? That's another story, altogether, and an interesting one). Accordingly, crop prices are rising steeply, Bloomberg reports. Of course, we can't tie any individual heat wave to long-term climate trends—there's plenty of random weather variation even in times of climate stability. 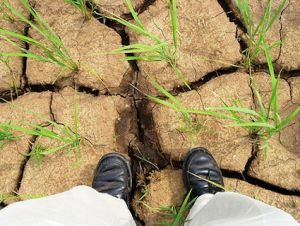 But we do know that hot, dry weather can stunt plant growth and reduce yields—and we also know that we can expect more hot, dry weather in key growing regions as the climate warms up. I hope the current heat wave gets policymakers thinking about the effect of climate change on food, because for for a long time, the consensus was that global warming might be more or less neutral for agriculture. Sure, the thinking went, climate change will likely make droughts more common and make some already-hot areas too hot for farming; but it will also lengthen the growing season in cold-winter areas like the US Midwest, perhaps increasing crop yields. Also, all that carbon dioxide we're pumping into the atmosphere by burning fossil fuels would be manna to plants, allowing them to grow faster. These factors, many thought, would largely cancel each other out, and mean that climate change would have no great effect on global food production. But back in 2008, a pair of researchers from the USDA and Columbia University shattered that comforting idea. In a paper for the National Bureau of Economic Research, they looked at three major US crops (corn, soy, and cotton) and found that rising temperatures would indeed cause a slight increase in crop yields—up to a certain point. But when temperatures climb above that critical threshold, yields would plunge dramatically. And here's the kicker: At current levels of greenhouse gas emissions, average temperatures are expected to rise well above the critical levels identified by the researchers. As a result, they project that yields will fall by the end of this century by as much as 43 percent "under the slowest warming scenario" and 79 percent "under the most rapid warming scenario." The paper should have exploded like a bomb in US and even global policy circles. The US produces around 40 percent of the entire globe's corn and soy, the authors pointed out. The global food system is highly geared to those crops, and dwindling production in the US heartland would be devastating. You'd think policymakers would have been compelled to act. Instead, they looked the other way. President Obama's tepid push for a climate bill collapsed ignominiously in the Senate, and the much-ballyhooed Copenhagen global climate talks ended in a cloud of hot air. According to Monsanto's own data, its drought-tolerant corn seeds don't work any better than already-existing conventional varieties. The conventional answer is: Trust Monsanto, the dominant player in the genetically modified seed market. Back in 2008, the company announced a commitment to "increase global food production in the face of growing demand, limited natural resources, and a changing climate." It would do so by engineering novel seeds that "result in more production per unit of land, and reduced use of energy, fertilizer and water per unit produced." The company vowed to "double yield in its three core crops of corn, soybeans and cotton by 2030, compared to a base year of 2000."